Otters are rare in the Netherlands; the last native one was killed in a road accident in 1988. Since 1992 Staatsbosbeheer (National Forest Preservation) has been trying to reintroduce the otter in Dutch waters. Today five new ones were introduced in the Overijssel nature park De Wieden. In the early 1900s there were at least 300 otters in this country. This number was reduced to around 40 by 1983, and the European Otter was officially extinct (in the Netherlands, that is) in 1988. Bringing them back in the Dutch fresh-water ecosystem hasn’t been easy; the otters need to have a group of at least 40 to survive on their own, but many of the ones brought here from Belarus, Latvia and Poland die or leave. Since July 2002 several groups of new otters have been set out: fifteen in 2002, five in 2004 and this week five more. Unfortunately at least five of these have been killed on the road, and five others left the area where they were being monitored. One otter has died from cancer, and another died from a broken jaw. Procreation isn’t going very well either; DNA research and autopsy on dead females last year showed at least four to eight births, but it is uncertain if these are still alive. The new otters that were set out today were caught in Poland and Latvia, where apparently they have plenty of them. There are IUCN (World Convservation Union) guidelines for reintroducing a species. For instance, the otters should preferably be of the same subspecies or race as those which lived here before. They should also not differ too much from the surrounding (foreign) populations with which exchange may occur. Additional measures are being taken to make the otters comfortable. Ten years of preparation have preceded the introduction of the otters; water quality was improved and new land was bought so that there is now a 12,000 hectare area for the otters to live undisturbed. The otter is an important animal for the Dutch fresh-water ecosystem; it is at the top of the food chain, and if the otter can survive then that means that the environment is also okay for other rodents, birds and insects. Let’s knock on wood that this new group of otters will live long and prosper. 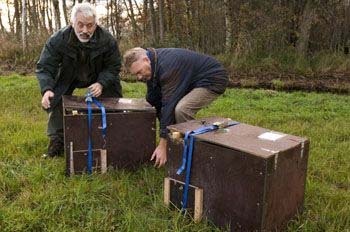 There is an official website for the return of the Dutch otter at www.terugkeer.nl. This entry was posted on Tuesday, February 7th, 2006 at 8:06 pm CET and is filed under Life in Holland, Nature, News	with tags . You can follow any responses to this entry through the RSS 2.0 feed. You can leave a response, or trackback from your own site.